I wish I could write more eloquently because I would like to describe to you how I’m making my life more difficult than it really needs to be. Maybe I’m way out there, or maybe there are other parents like me. 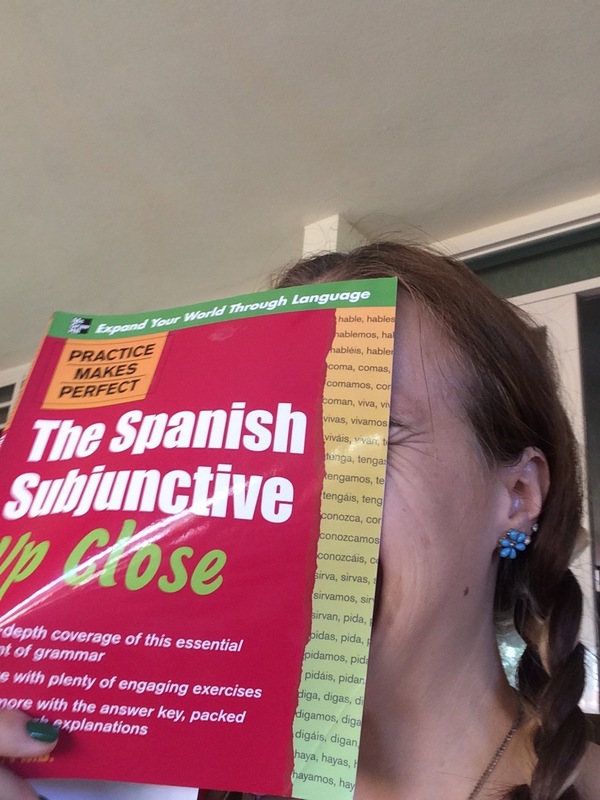 I, foolishly and unnecessarily, put tremendous pressure on myself to learn and speak Spanish. I made myself audio recordings so I can quiz myself for half an hour each day during my solo car rides. I hire a tutora to come once a week to calmly answer all my questions and speak slowly to me, and listen to me take a full minute to craft one sentence. I plan coffee dates with certain friends and ask them to let me practice. Gracias amigas! Every English conversation I have with a native Spanish speaker I berate myself for wasting an opportunity (unless it is very important like government or medical business). The grocer mumbled something to me that I didn’t understand (stop mumbling!) then said, “Oh yeah, you speak English.” No I don’t! Wait yes I do! But, wait! I can do better! (just stop mumbling dude). Don’t give up on me! Some people are easy to understand. Some, for some reason, cause me a lot of problems. Ack! Are my kids learning Spanish? Why do the other kids switch to English when talking with my kids? Am I doing enough? Should I speak more Spanish with them? They already watch their TV shows in Spanish… do they need a tutor too? Seriously, I’m outta control. I worry way to much. I’m not looking for reassurance or really support from you, dear readers. My rational brain knows everything is fine. Slow but sure, look at the big picture, day by day. From where we’ve come from to where we are now, things are going great. Every once in a while my kids really do surprise me with their knowledge. And I know that we don’t have a deadline. There is no life quiz. This learning is on-going. Gotta keep it fun and relevant. I moved my kids away from Wisconsin to a Spanish speaking country for crying out loud. THEY ARE GOING TO LEARN. Chillax. I’m just setting up a foundation. Year by year. I’d say I learn 2-3 new words/phrases every week. Seems small, but I’m not living with a native speaker, and I’m trying to remember everything already crammed in my head. SUMMER! I’M GOING TO FORGET IT ALL WHEN WE TRAVEL! No, no. Again, this is not rational. Anyone else’s mind jump off the deep end before the rational voice speaks up and yells, “STOP FREAKING OUT!” Yeah. Friends have told me that it took them 3-5 years to become really fluent in English. And they were in a situation where all they heard walking out of the house was English. People so quickly speak English to me here that usually I have to constantly ask them to speak Spanish, or just keep speaking Spanish even if they speak English to me. hm. What a fascinating pressure I’ve given myself. Pressure to grow, to challenge myself, speak up for myself, better myself. I’ll keep taking steps toward my goal, mi meta, and perhaps just shed the stress and guilt. That doesn’t help anything. I probably look pretty funny. And my bubbly personality doesn’t come through at all. So I look goofy and boring! haha. Kidding. It’s all part of the journey. 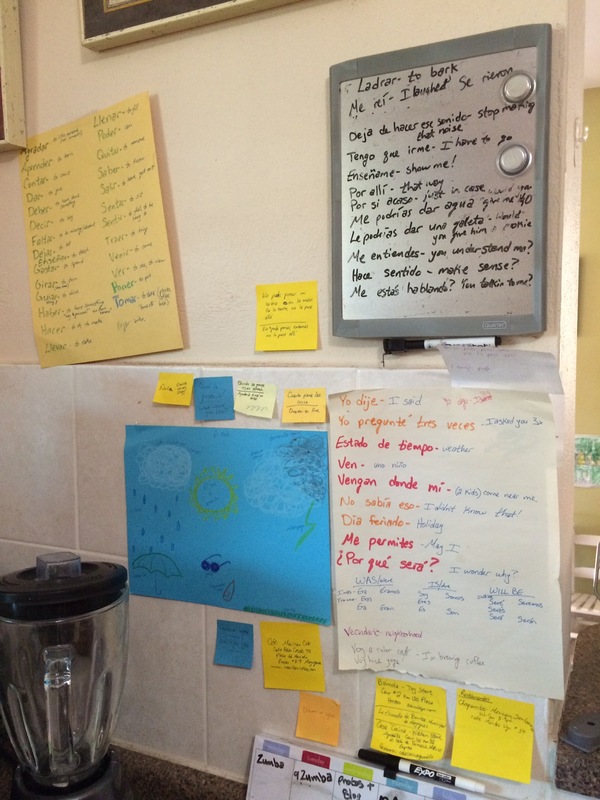 This entry was posted in Puerto Rican spanish and tagged bilingual, learning spanish, Puerto Rico, tutor. Bookmark the permalink. Oh, my goodness, you poor woman~ Too much pressure on yourself and most definitely try to make it fun for you your kiddos. My husband is learning but I really need to step up, myself and make a start. Relax and you will eventually get it (saying it to myself, too, haha).